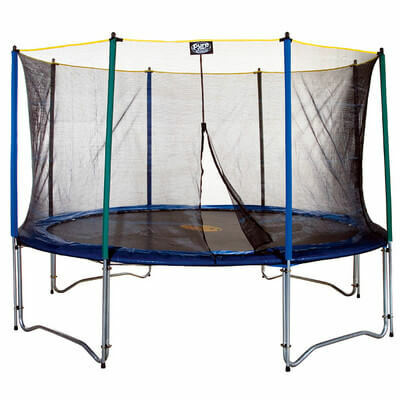 Pure Fun 12ft Trampoline & Enclosure Set is one among the various types of Pure Fun trampolines. Because of T-junction which strengthens frame they are the most stable and safest trampolines in the market. They boast of tubing made of an iron and steel alloy. Pure Fun features 4 W-shaped legs with eight points that touch the ground which prevents the trampoline from swaying and even falling. This trampoline certifies all safety standards set in terms of feat, safety and sturdiness. The trampoline also has 72 steel made springs which are good enough to provide high intensity bounce. Its landing pad made of a thick cushion railed over its steel springs. It`s frames are coated with vinyl and its mat is made to sustain harsh weather conditions. It`s very simple and easy to put together. The trampoline comes with a two year manufacturers warranty. 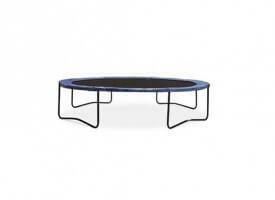 The trampoline set has similar features to the trampoline itself, fun and simple to put together. Check latest price of PureFun Dura-Bounce on Amazon! This Pure Fun 12 ft trampoline & enclosure set is 12-foot long. It can sustain weights up to 250 lbs (115 kg). It has 72 steel springs for the landing pad and has an anti rust frame made of iron- coated- steel. Its joints are manufactured with T-shape hence no welding is done. 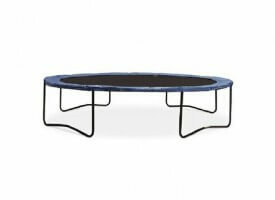 Pure Fun 12ft round trampoline has a polypropylene mat and a enclosure fabric that is resistant to sun UV radiation. The enclosure netting is held in position with an anti-rusting steel framing and has a zip for your ease of entry. In inches, has a length and width of 144 inches and a height of 137 inches. Its frame has a cover coated with vinyl. Leg poles are clamped with steel-made inflections. Its quality is certified and approved by American Society for Testing and Materials (ASTM). Pure Fun 12 ft trampoline has a 2 year warranty. The warranty covers any error on the material and failure on skill used on this product. Pure Fun 12 foot trampoline & enclosure set has a large landing pad – this gives adequate bounce room. It also has a mesh fabric surrounding that ensures safety of your children. With the mesh fabric also, you don`t need a shade since the mesh protects you from direct sun rays. Another plus is the ease of setup both for the trampoline and its set. The vinyl coats on the frames make it durable and resistant to rusting. You never worry about its storage because the padding material can withstand outside weather. The frame has eight ground touching points which gives you absolute steadiness. 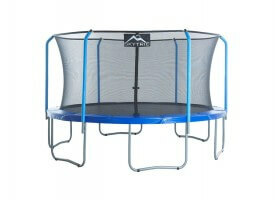 It has shock absorbing poles which ensure you bounce without fear of weight damaging the trampoline. The trampoline also has a reasonable weight limit for users (250lbs) and comes with its own fixing gear, reducing the cost of buying “set up&repair” kit. Bottom line – Pure Fun 12 ft trampoline & Enclosure set keeps you safe while jumping! The height makes the Pure Fun 12 ft trampoline unfit for some people. If you are not used to spring trampoline, it may take time to get use to this trampoline. It being an outdoor trampoline adds to your insurance costs. You may incur costs too for setting up a secure area for it to avoid hazards. It can damage your backyard lawn because it shelters some areas from sunlight. You also have to bear with dismantling it after use for storage and setting up again the next time you want to use. Even though both chores are easy, they are cumbersome and time consuming. All this is due to the size that makes it big for your door. It may be time consuming to set this trampoline & enclosure up, but once finished; it is very safe and strong. Trampoline mat has a high intensity bounce that makes you get value for your money. You are not worried about the safety of the kid because the enclosure does it all. The sun rays are no scare because the enclosure is UV protective. If you are looking for fun, style, entertainment and safety, all in one package then the Pure Fun 12 ft trampoline & enclosure set is the trampoline for you. 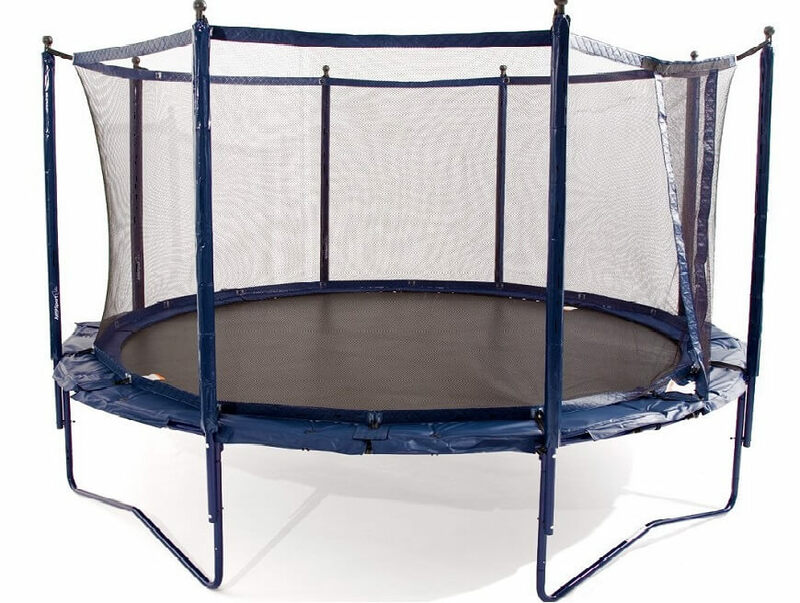 Very safe and strong trampoline with high intensity bounce. 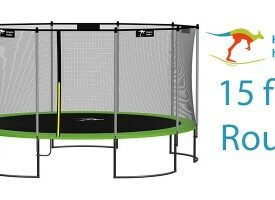 12ft Pure Fun is ideal for trampoline for children.